Learn how to save money and stay warm during the winter without suffering in the cold. Everyone wants to save money and stay warm during the winter without freezing before the spring thaw, but you don’t have to suffer because you keep the thermostat on low. Keep reading to learn the tricks professionals use to get more warmth per penny spent on heating costs. Once temperatures fall below freezing, you need to keep your home warm enough to keep your pipes safe. Ruptured plumbing in the dead of winter will wipe out any savings you’ve created from keeping the temperature low. However, there are times when it’s safe to turn down the heat. For instance, you can keep your thermostat between 62 and 68 F at night. Cooler temperatures help you sleep better while also cutting your costs. You can also turn the thermostat down during the day while you’re at work. During hours when you’re at home aim for 72 F or lower, according to your comfort. Your thermostat might have programmable features to make it easier to adjust the temperature throughout the day. Weather projections for the winter of 2018 say the season will be colder and come with more precipitation than previous years. Georgia will see freezing temperatures, snow, and ice. Having adequate heat could save your life, but not every family has room for heating expenses in their budget. Georgia’s Low Income Home Energy Assistance Program (LIHEAP) helps you handle the extra burden. The program helps in several ways. First, it pays a portion of your energy bill. More importantly, enrollees won’t have their electricity shut off due to non-payment during winter months. The most important aspect of LIHEAP participation is free winterization services and select home repairs. These services immediately make you more comfortable, lower your heating costs, and improve your property value. All it takes is submitting the paperwork. Recipients of certain types of government assistance automatically qualify. Those who don’t can talk to their energy company about establishing a payment plan to make winter bills easier to manage. If you’ve been through many cold winters, you know the cold air dries out your hair and skin. When indoor humidity gets too low, you can start to feel sick as well. Your eyes get red and irritated. You develop a scratchy throat. It’s no fun, and those dried-out membranes in your lungs and nose can leave you vulnerable to catching the flu or a cold. It’s a time-honored tradition in many homes to start-up the humidifier at the start of the cold season. Adding moisture to the air protects your health, but did you know it also helps you feel warmer? There’s no question humidity plays a heavy hand in Georgia’s hot, sweltering summers. Leverage the same principle to lower your heating bills in the winter. By adding moisture to your indoor air, you feel warmer without cranking the heat. Your heating and cooling system picks up dirt, dust, and debris throughout the year. It packs your ductwork and gums up the gears. All that resistance forces your heater to work harder to keep your home warm. You wind up using a lot more energy than you would otherwise. Schedule a preventive maintenance visit at the start of the season to clear out the grit and debris. Also change your furnace filter once a month. 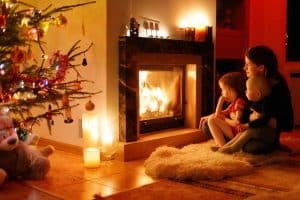 Those two things are easy enough for anyone to do and can significantly lower your winter heating costs all by themselves. Keep an eye out for HVAC companies who offer a maintenance plan too. You often save money by joining the plan versus scheduling separate maintenance visits in spring and fall. These plans come with one heating and one air conditioning visit a year, and also provide you with discounts on repairs, special warranties, and prioritized service, depending on the company you choose. Even if you’re working to learn how to save money during the winter, you may need a title pawn to help you in the meantime. Come on into Title Tree, and we can help you get the cash you need.